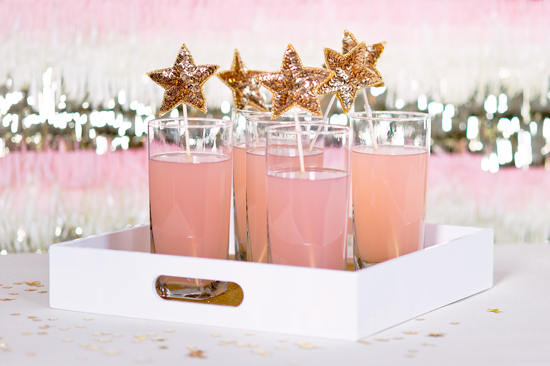 Whether you're having a little holiday bash to ring in the New Year or an all out slamming shindig, these quick little decorating ideas are sure to add zing to your party and are easy as pie and just as sweet! Take a peek . 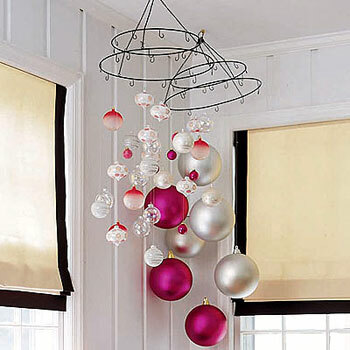 . .
You already have your ornaments out, so why not get a little more use out of them before you pack them away until next year? And just in case you want something in a different color scheme than your typical holiday decor, all of the stores just happen to be selling the most gorgeous & shiny bulbs (check out Target or Pier One!) for 50% off, so you are in luck! Here's what you do . 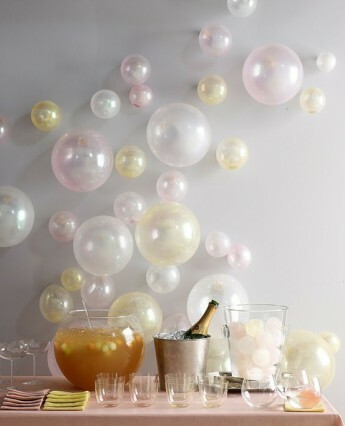 . .
And I just love this darling drink station too; so simple to put together (all you need are a few balloons!) but this really packs a punch and will certainly add a bit of festive fun to your fete . . .
Just blow up pearlized balloons in varying sizes (some less than others) and tape it to the wall for the easiest backdrop ever! 1.) Lay the sequinned star over the craft felt and cut the felt to the size and shape of the applique. Place the applique sequin side down, and position the bamboo skewer in the middle of the applique. The placement should be set so that the top of the skewer aligns with the horizontal edges of the top left and right star points, and the skewer stem aligns with and breaks through the center of the bottom two points. Hot glue the bamboo skewer in place in this position. Set aside with its matching felt cutout to cool and set, and continue creating more as needed. 2.) Draw and outline of hot glue around the edge of the felt cutout, then draw a small “X” of hot glue in the inside of the outline. Press the felt cutout over the applique and the bamboo skewer to create a covered backing for a finished look. Your local drugstore or Target has a huge selection of travel-sized goodies that are just the right fit for your party survival kit. 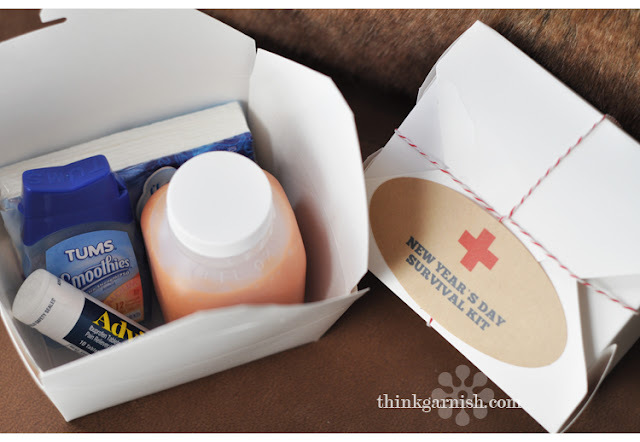 Throw in goodies like Advil, Tums, Emergen-C, tissues, hair ties, and a small bottle of bloody mary mix and your guests will be sure to thank you come morning. Tie the whole thing up with twine and add a sticker and you are all set! Juneberry Lane will be on hiatus until after the holiday! 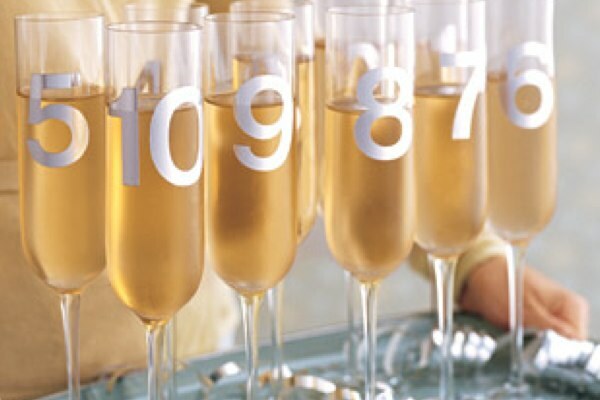 Hope you all have a very Happy New Year and we will see you in 2012! !